YouTube and Facebook video ads are eating into TV commercial revues across the world, with global advertising revenue from online video doubled to $11.2 billion between 2011 and 2014, according to new research. 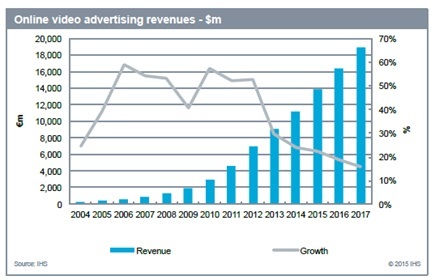 The study, from IHS and Vidiro, also indicate that and video ad revenues will jump to $13.8bn in 2015. “Online video advertising is exploding,” said Eleni Marouli, senior analyst, IHS Technology. YouTube’s numbers showing a 50 percent growth in hours watched, year on year.